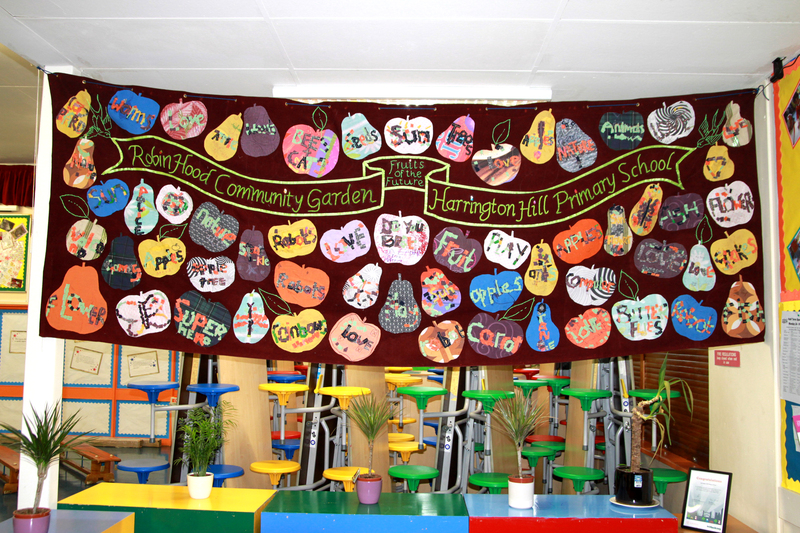 We have worked with our local primary school on a beautiful cloth banner which encapsulated the hopes and dreams the children had for their community garden. 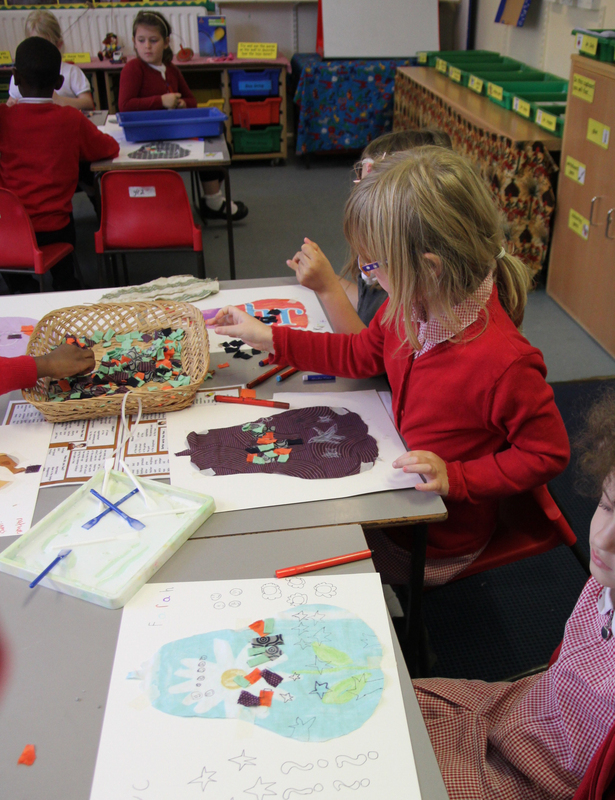 We worked with Years 1 and 2 to design a fruit – each with a word that represented their wish. 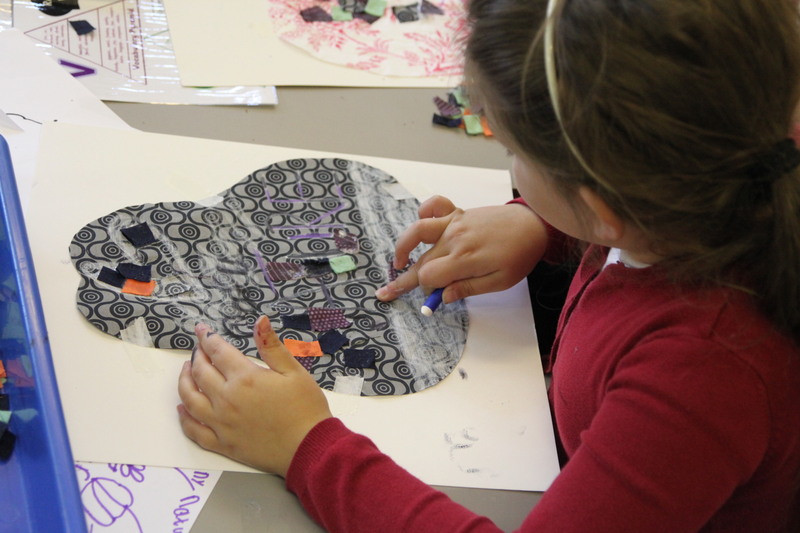 We had a range of ideas – from worms to robots to love. The children all were very excited about the garden and learnt a lot about what goes on there. They went home with leaflets and information about how to get more involved. Nicola Godlieb. 2011. ROBIN HOOD ARCHIVE OF THE IMAGINATION . .
During the digging up of the Robin Hood Garden we found many broken bits of pottery and unusual coins, old toys and even what looks like an old gravestone. We saved these with the aim of making a mosaic table or plaque to commemorate the history of the garden and the stories of the people who came before us. 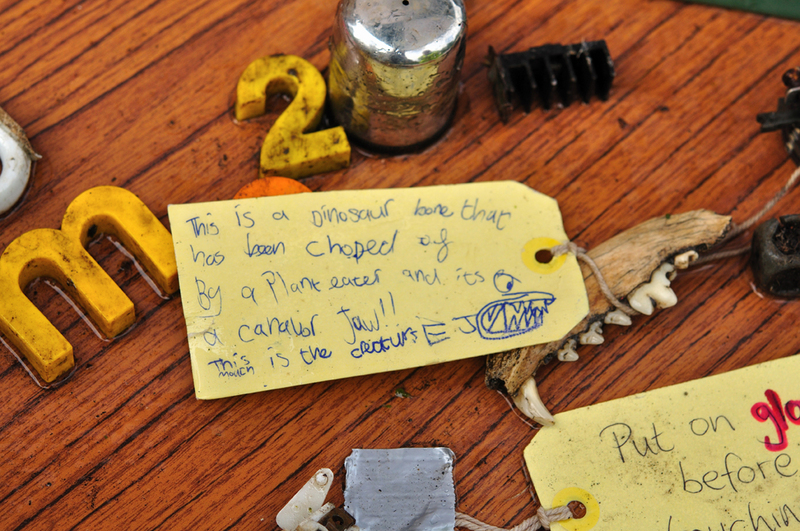 The artefacts we found initiated some great stories from the children who have been on site. Whose salt seller was this? Was this the best Sunday crockery smashed at a wedding? Who played with the toy car before it was lost? It has inspired the idea that these finds could create a wonderful storytelling project with Harrington Hill the local primary school. 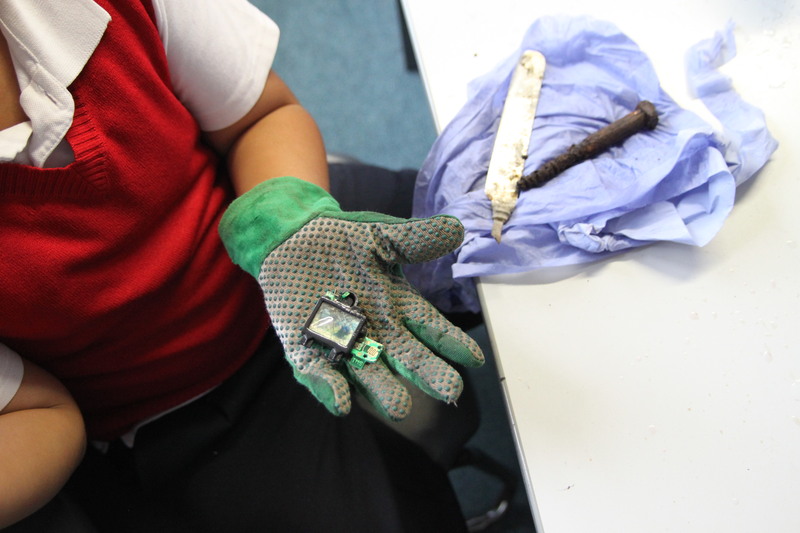 We worked with children from years 1&2 from Harrington Hill School on the history of the area, the war during which a lot of the streets were bombed. The different buildings which have stood in this area – the invention of Plastic (!) just a little further down the river Lea, etc. 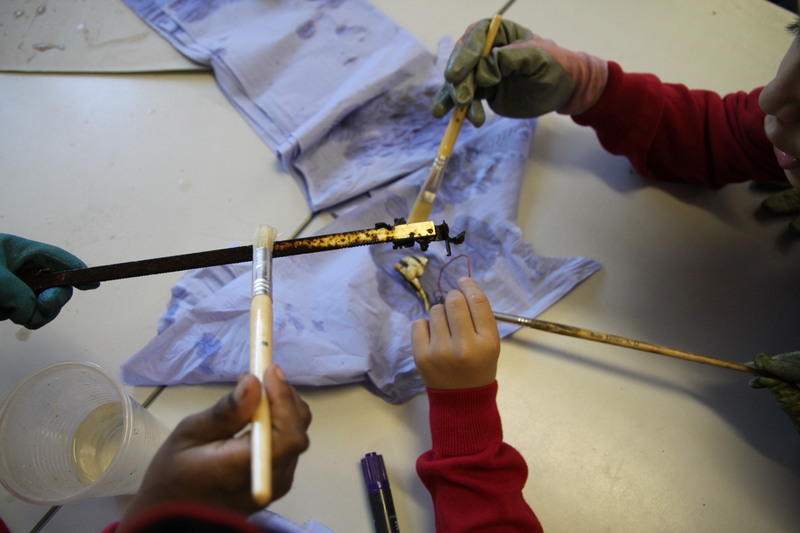 The children selected a piece of the “buried treasure” cleaned it up using brushes and gloves and wrote down ideas for a story. 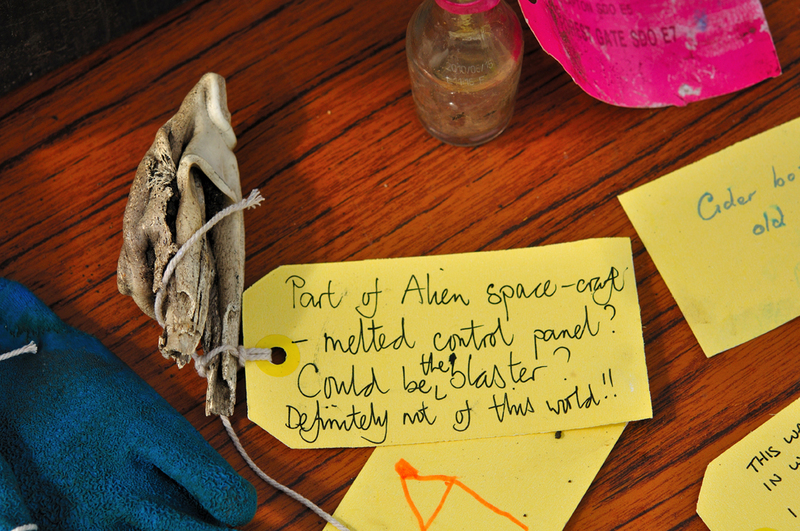 These were then attached to their object with a card label or parchment, as in a museum display. 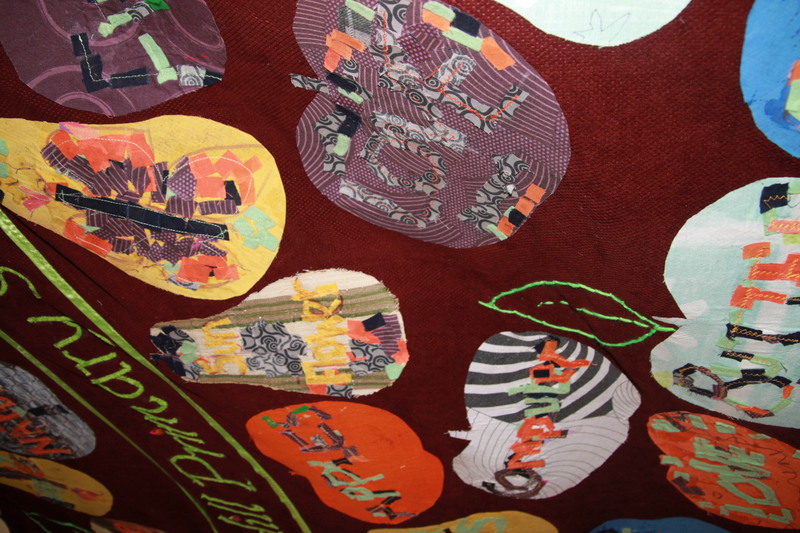 The project has created an imaginative display for the school foyer, and generated much discussion about the Robin Hood Garden and also the history of the Area.Nicola Godlieb. 2011. Cleaning away the years of dirt and occasional bugs! Talking about the stories that might be behind their objects. Some finished objects with their stories. More pictures to follow of foyer display piece. . . 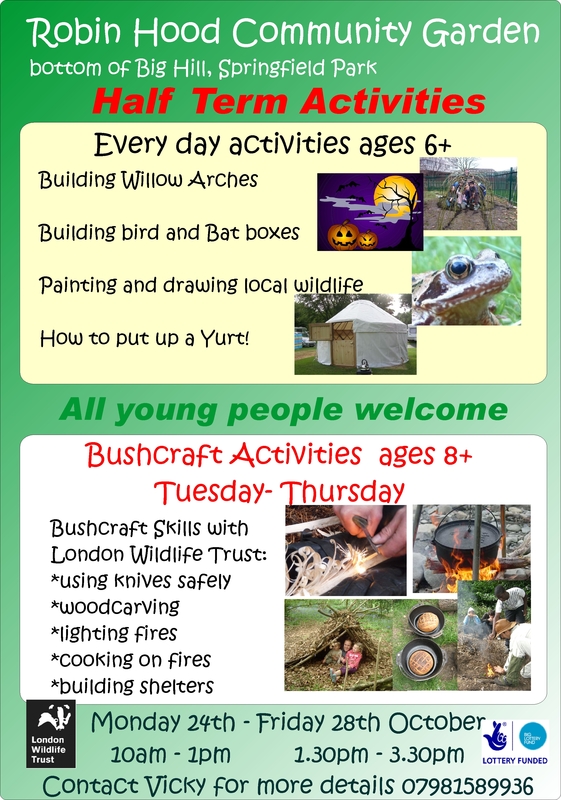 The Autumn Half term saw us vote for our funding to put on workshops run by The Fantastic London Wildlife Trust. We had around 12 – 15 children per day and they all learnt amazing things – check out our November archive for the pictures. 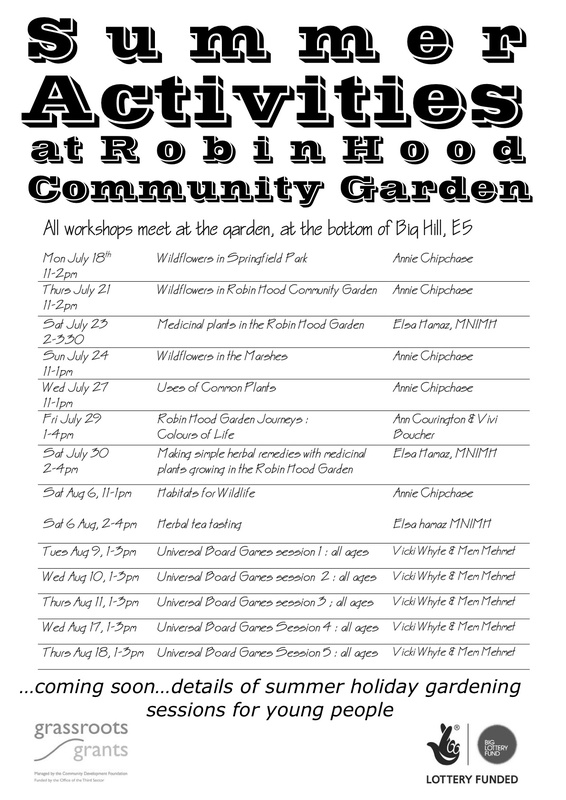 Our (Grassroots Grants funded) summer gardening sessions for young people provided plenty of fun, exercise and learning for local children and young people. After a slow start following the riots (it was eerily quiet in the area) the numbers quickly picked up and everyone enjoyed exploring the sights and tastes of the garden, digging and discovering, watering and caring for the trees and plants, gasping at ‘the world’s biggest apple’, planting bee-friendly plants for our nectar border and using the Kelly kettle to make mint tea. We were also able to help out High Hill Residents Association by weeding their Stepping Stones Garden which was done with great enthusiasm despite the presence of many spiders! Many thanks to our regular volunteers who helped the sessions to run smoothly, especially to Pete for his Kelly Kettle skills and commitment. 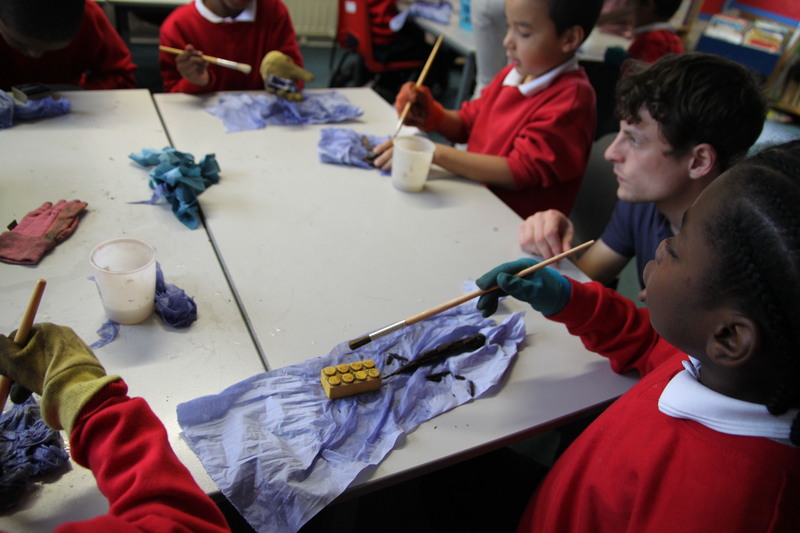 AND WE HD MANY OTHER OUTREACH PROJECTS IN 2011 THANKS TO OUR FUNDING FROM GRASSROOTS GRANTS. THE MAIN BLOG IS FULL OF PICTURES SO TAKE A LOOK!